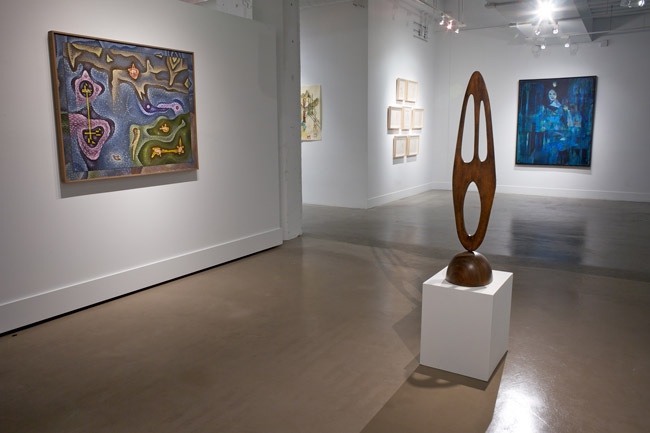 San Francisco — Gallery Wendi Norris is pleased to present Stellar Orbits, a group exhibition of works by Surrealist artists Max Ernst, Gordon Onslow Ford, Wolfgang Paalen, and Dorthea Tanning. Notorious for adventurous social lives, inspired by both intellect and eroticism, the artists and thinkers influenced by Andre Breton shared a web of influence, emotion, and inspiration. The works in this exhibit attest to the inextricable bonds between each artist, relationships that span decades and continents, and forming conceptual networks across multiple methodologies, orthodoxies, and artistic missions. Max Ernst’s Portrait of Dorthea, (1960) displays both his inventiveness as a painter as well as his tenderness for his wife. In it, her face appears amidst vertical streaks achieved through experimental scraping and rubbing of the paint and canvas on various objects, carefully rendered amongst the visual noise and chaos of the composition. A loving portrait, she is almost lit from within, and bears a glowing yellow streak across both cheeks. In comparison, Dorthea Tanning’s suite of intimate drawings reverse the cliché of the muse, casting the male partner in the relationship as the object of eroticism. Fun/ Vernissage (1965) explores her artistic aspirations as well as taboo desires, and is at once witty and unabashedly sexual. Wolfgang Paalen and Gordon Onslow Ford, while not involved romantically, were confidantes, and provided one another with critical feedback and advice, and Ford contributed to Paalen’s important avant garde journal DYN. Both artists explored the function of psychological symbolism in abstraction. Ford’s Landscape of the Muse (1943) can be seen as a map of interacting ideas or energy fields, abstracted in line, color, and repetitive marks. Paalen’s Mexico (1948), draws on his collection of pre-Columbian sculpture, and references aboriginal crafts, as well as an archetypal human face. The evidence of human interaction is apparent in even such a wide range of works as these because the bonds knitting the Surrealist artists together survived even longer than Surrealist artistic methodologies, and were based on both deep emotion and rich intellectual exchange. All of the artists in this exhibition were at one point associated with the Parisian Surrealists founded by poet and writer Andre Breton, which was a vital cultural movement that began in the 1920s. While each artist’s works have been exhibited widely both during their lives and posthumously, Surrealists themselves considered their work to be largely philosophical and revolutionary. An international phenomenon, the Surrealists inspired dramatic political thought and activism both before and after the Second World War.